The Blot Says...: A New Mecha Dunny 3” Vinyl Figure Colorway by Frank Kozik x Kidrobot! 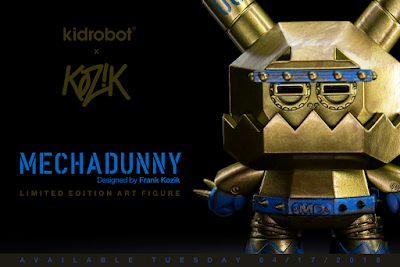 A New Mecha Dunny 3” Vinyl Figure Colorway by Frank Kozik x Kidrobot! Frank Kozik’s popular Mecha Dunny 3” vinyl figure is back with an all new, super limited colorway! The Mecha Dunny is a sculpted take on the classic Dunny shape that first debuted way back in 2008 as part of Kidrobot’s iconic Dunny Series 5. This is just the latest colorway in pop artist and Kidrobot Creative Director Frank Kozik’s popular Mecha Dunny series. Are you ready for battle like the Mecha Dunny!?! After debuting at the inaugural China Wonder Festival earlier this month, this new Mecha Dunny 3” vinyl figure by Frank Kozik is now available online at Kidrobot.com for just $14.99. But act fast, because only 300 pieces are available (out of a total limited edition run size of 1,000 figures).